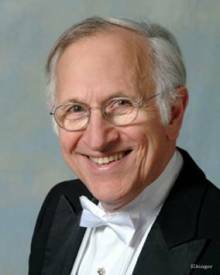 Gustav Meier was Music Director of the (Greater) Lansing Symphony Orchestra from 1978 to 2006 and was given the honor of Music Director Emeritus. He is known internationally as a teacher of conductors. He has led orchestras around the globe while teaching at Yale University, the Eastman School of Music, the University of Michigan and the Tanglewood Music Center. Gustav Meier has conducted the Pittsburgh and China National Symphony, the Hungarian and Vienna State Opera Orchestras, the Sao Paulo State Symphony, the Chicago’s Grant Park Symphony Orchestra, the Zurich Tonhalle Orchestra, the Long Beach and Colorado Symphony Orchestras and others. He has led performances at the New York City, Santa Fe, Miami, San Francisco, Zurich, Syracuse and Minnesota Opera Companies. Innovative programming has earned Mr. Meier critical acclaim. He collaborated with film director Robert Altman (Igor Stravinsky’s Rake’s Progress), conducted William Bolcom’s Song of Innocence and Experience (American Premiere), Gian-Carlo Menotti’s Help! Help! The Globolinks! (American Premiere), Elliot Carter’s Double Concerto (First Performance), Chris Rouse’s Infernal Machine (First Performance) to mention just a few. Students of his include Marin Alsop (Music Director Baltimore Symphony and Cabrillo Festival), Antonio Pappano (Music Director Royal Opera Covent Garden and Orchestra Nazionale di Santa Cecilia), Bobby McFerrin, Yakov Kreizberg (First Prize Stokovsky Competition Winner, Music Director Netherlands Philharmonic and Principal Guest Conductor Vienna Symphony Orchestra), Rico Saccani (First Prize Karajan Competition Winner and Music Director Budapest Philharmonic Orchestra), Carl St. Clair (Music Director Komische Oper Berlin and Pacific Symphony Orchestra), Bundit Ungransee (Co-First Prize Winner Lorin Maazel Conducting competition and Principal Guest Conductor Seoul Philharmonic Orchestra), Mark Gibson (Orchestra and Opera Director of Cincinnati Conservatory), Jun Märkl (Music Director Lyon National Symphony Orchestra), Ben Loeb (Director International Workshop and Festival) and more. Mr. Meier has received Honory Doctorate Degrees from Fairfield University, Kalamazoo College and Michigan State University and has been awarded with the Ditson Prize for his commitment to American Music. He is also the recipient of the Harvard Luise Vosgerian Award, the Max Rudolf Award of the Conductors Guild and the Distinguished Faculty Award from the University of Michigan. His book The Composer, the Orchestra and the Conductor was recently published by Oxford University Press. Mr. Meier passed away in May of 2016.